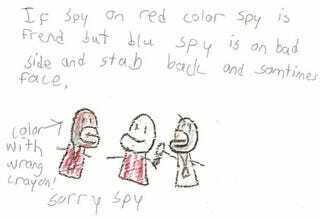 The mangled syntax and childlike enthusiasm of Team Fortress 2's Heavy is very much reminiscent of a five-year-old's view of the world, the obvious inspiration for this crayon drawing about his friends and teammates. The entire thing is so damned large I have to link it here. Note: Yes, we know a child did not actually draw this. But we do not know that a meathead soldier who speaks broken English did not.